The start of the adventure. This photo was taken 6,538 days ago. Andrew and I had been dating about a year. I knew he was the man I was going to marry. Of course, that was assuming we could travel together. Some people just can’t. We had some of the most wonderful meals. We went to a kitchy luau. We snorkled. 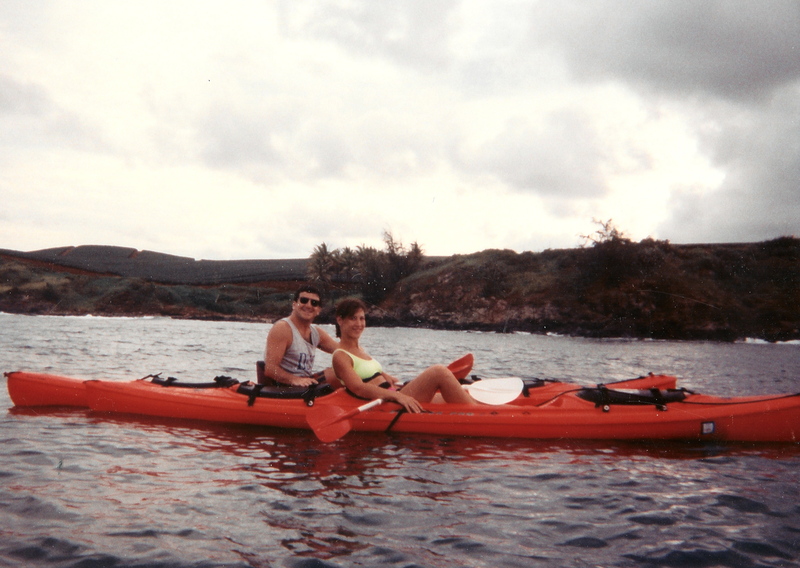 And, as you can see by the photo here, we went sea kayaking. I remember the hotel, The Plantation Inn. It was small. Really nice. Not pretentious. The restaurant had the most amazing fish. It was a kind I’d never heard of before. Something local. The best fish I’d ever had. The trip was an adventure full of unknowns and new experiences. I don’t think I ever told Andrew it was my first time snorkeling (outside a swimming pool) and I was really scared. The kayaking was a major effort in the waves but I didn’t want him to see how hard it was for me. It’s not that I wasn’t in good shape; I worked out regularly. It was just hard. A lot harder than I thought it’d be. I was still putting my best foot forward; hoping that he wouldn’t change his mind about me. Feeling insecure, but all romantic and lovey, just the same. We talked about marriage as the trip neared the end. We considered just getting married right then and there. We did decide that he’d give up his rental and move into my house. And we decided that we’d be engaged by the following June. Looking back, what an odd decision, but hey, here we are. Baby #1. Baby #2. Baby #3. All within 3-1/2 years. I’ve told stories of the years in between and I’ll continue to tell the ones I haven’t. But, not today. Today, I am just thinking. Thinking about the journey. So here we are on a kayak together. We’ve committed to stay on that kayak. But let’s be honest. Sometimes, I don’t paddle as hard as I should. Or just on one side. Sometimes, I’m busy playing with my iPhone and don’t notice that we’re headed for a rock. Or he’s aiming for that beautiful lagoon and I’m dreaming of open water. And sometimes, we’re just not in sync. Or we’re unable to keep a straight path. Sometimes, we need to stop paddling and just be. Because those can be the nicest times of all.